I got a nice surprise this morning to see some news I'd heard a while back publicly confirmed on Sascha Hommer's blog: Shintaro Kago will be appearing in the next issue of the fantastic comics anthology, ORANG! ORANG is put by one of my fave publishers, Reprodukt from Germany. Reprodukt is basically like if you took the most interesting German cartoonists and rolled them together with the best books from D&Q, Fantagraphics, NBM, and Last Gasp. ORANG is an annual (approximately?) book edited by cartoonist (and super talented dude) Sascha Hommer. I've posted previously about Hommer's excellent graphic novel, Insekt. 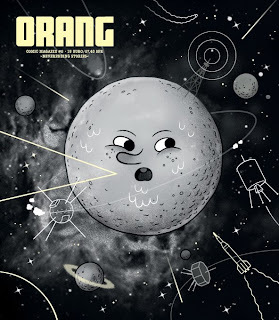 I just received a copy of ORANG 7 in the mail, and thoroughly enjoyed it... It's like a younger and more European version of MOME, but also features indie comics from China as well. The books are thick and have really nice paper & production values. No specific details yet on what Shintaro Kago comic will be in the issue, but I understand it's an original comic just for the anthology :) If previous issues of ORANG are any indication, the title will likely be in the original Japanese, with German and English translations as footnotes on the bottom of each page. Congrats to European fans of Kago- You're getting a treat! I'll post details on how folks outside of Germany can order copies when it comes out. really very cool those three artists that you posted!! I hope in english they can release a book or something about german comics! !Nowadays a lot of alternative publishers are realising anthologies of different countries with brillant comics!! I dont have any work,except for mathias schultheiss things!! apart from this!I want to have kago books in english or spanish right now!!! thanks for the good info as always!! ps: I have a curiosity, I want to know if you know what is doing now toyokazu matsunaga after ryuguden? ?Did you read paranoia killer or angel mark? ?I know bakune youung and I love it and also ryuguden that is a very strange thing!Perhaps that you read a lot of things in japaneses may be you know if he still works for ikki!! I can't describe how happy i am about those news. @Azraelito: It's exciting to see new Kago get published outside of Japan :) I think this is Kago's first publication outside of Japan aside from his appearances in Vice. I'm not sure about current Toyokazu Matsunaga stuff--- will look around! @Odber: You guys are lucky! NEW SUEHIRO MARUO X EDOGAWA RAMPO COMIC! TORONTO COMIC ARTS FESTIVAL ROUND-UP!